With legions of fans around the world the animated TV series Jonny Quest has been captivating television viewers for several decades now. This cartoon show has achieved a cult-classic type of status with viewers of all ages being fans of the show. 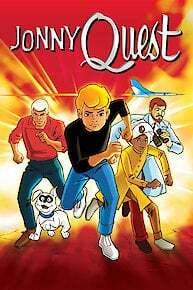 The namesake of the series Jonny Quest is a young boy who travels around with his scientist father Dr. Benton Quest solving one adventure after another. The Quest's are usually accompanied by Jonny's bulldog named Bandit, his Indian friend and adopted brother Hadji and their bodyguard Race Bannon. Jonny Quest is widely regarded as being a groundbreaking animation series that set the tone for several other action-themed cartoon programs. There's plenty of action in each episode of Jonny Quest with Jonny and crew often using boats, airplanes and various types of experimental flying craft. The semi-realistic cartoon artwork combined with a limited form of animation gave the characters a unique appearance and style. The group encounters all sorts of dastardly villains including human, monster, ghost and mechanical forms. Through a combination of investigative teamwork, scientific discoveries by Dr. Quest and coincidence the crew regularly rights wrongs and saves the day. On many occasions Hadji and Bandit the bulldog help to save the group from peril. The original Jonny Quest series was a Hanna-Barbera production that was on the air from 1964-1965 but has maintained a loyal fan base ever since through the showing of the series in reruns. In addition to the original series there were two other animated Jonny Quest television series that were presented years after the original program aired. The plots on this animated series are quite imaginative and well-written with Jonny and crew traveling to locales around the world. With their futuristic equipment the Quest's and company are able to overcome an array of evil-doers who are intent on wreaking havoc on society. Some of the adventures that Jonny Quest and his companions encounter include finding lost ocean vessels, foiling assassination attempts, fighting monsters and zombies and escaping from kidnappers. Besides offering action and adventure Jonny Quest also regularly provided viewers with interesting scientific facts and trivia. Because of the continuing popularity of the television program there are many Internet web sites where the show is discussed. Zin is part of a plot by an ancient Druidic cult to steal a crystal skull that Dr. Quest is examining at a London museum. In the heart of a swamp, people and animals are being attacked by a strange plant-like creature. Hadji discovers that his mentor is being forced to use his telepathic abilities to undermine a peace conference. A cyborg pilot with a grudge against Race steals Dr. Quest's new invention. In a plan to rule the skies, an old enemy of the Quests uses a mechanical cloud to hide his new airship--and to wreak havoc from above. Dr. Quest comes to the aid of an archaeologist friend who has been attacked by statues guarding the tomb of an Chinese emperor. During a drilling operation, the Quests discover an underground cavern, and ancient civilization--and Hardrock, who helps them explore the subterranean city. While on an archaeological expedition in Scandinavia, the Quests discover a giant Viking ape that was frozen alive--but which has just been reawakened by volcanic activity. The Quests and their friends travel back in time to World War II as they search for a sunken Nazi submarine. A kidnapped scientist is pressured to develop a missile sabotage system for Zin. Zin uses a fake UFO to steal Quest's new invention. Arab raiders use the robotic horses developed by a friend of Dr. Quest. In the South Pacific, a scientist develops a means to clone prehistoric creatures--and uses his reptiles to destroy radar installations. A Yeti descends from the mountains, terrorizing a Tibetan village when it appears in a nearby palace. Gold-smugglers try to scare Quest away from his nearby research site in the Canadian woods by using rumors of werewolves. The Quests stumble across a jungle mine being worked by slaves overseen by a cruel owner and his trained pterodactyl. Jonny Quest is currently available to watch and stream on Hanna-Barbera. You can also buy, rent Jonny Quest on demand at Amazon Prime, Amazon, Vudu, Google Play, iTunes online.